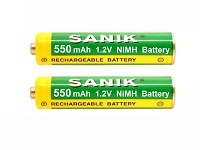 This 2.4v 500 mAh Ni-MH battery pack is made from two 3/5F size NiMH cells which are called prismatic cells as they are flat and rectangular in shape, usually so the phone they are in can be kept as slim as possible. When your new battery is first installed in the Sagemcom D77T handset, it is usual to charge the battery for the recommended time as stated in your instruction manual. This is usually between 16-20 hours before use. After the initial charge period, your new battery should work normally.